At St. John Lutheran Church we hold to the Biblical teaching that by His death and resurrection Jesus Christ won forgiveness of sins and eternal life for us and all people. The Holy Spirit calls and gathers us by God’s forgiveness of sins in Jesus Christ. The Church is the people of God assembled around the Gospel of Jesus Christ and His life-giving Sacraments. Every time we gather around His Word and Sacraments, He delivers this forgiveness and life through these God-given instruments. God makes us His holy people who love and trust Him above all things and who serve their neighbor in love. 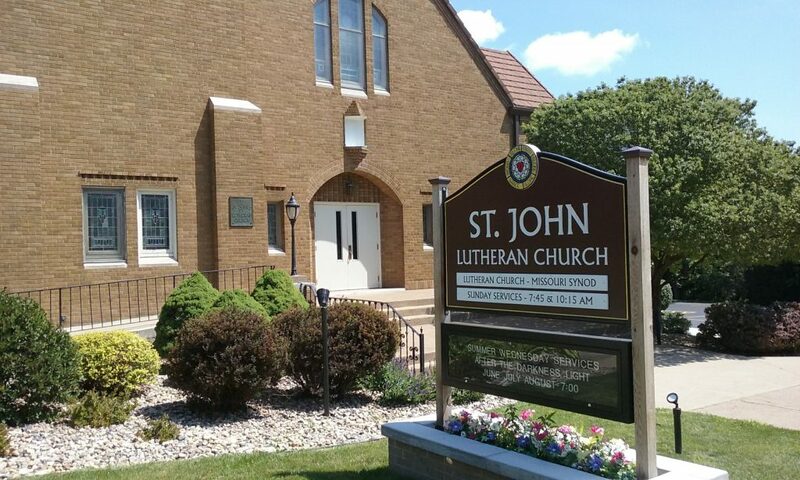 We invite you to visit St. John, whether you’re a life-long Lutheran, looking to find out more about the Lutheran Church, or just plain curious about church in general. We invite you to join us as we grow in the life of Jesus Christ through worship, fellowship, service, and learning, so that all we do may bring glory to God. Divine Services Sundays @ 7:45 and 10:15 a.m.
Sunday School & Adult Bible Class @ 9:00 a.m. Advent and Lenten Services Wednesdays @ 1:30 and 7:00 p.m.
Join us for Divine Service and Bible Class this Sunday!